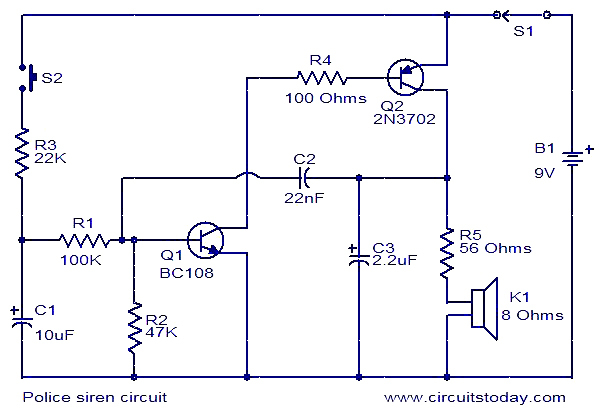 The circuit given here produces an alarm similar to the police siren. When you press the push button switch S2 capacitor C1 will charge and this will make the transistor Q1 to ON slowly. When the switch S1 is released the C1 will discharge and the transistor Q1 will become OFF slowly. When the Q1 is switched ON, its collector voltage falls and makes the transistor Q2 ON. The capacitor C2 will be charged almost to full supply voltage. This results in an increase in the collector-emitter voltage of Q2.This change in voltage is coupled to the base of Q1 via the capacitor C2.As a result the transistor Q1 comes slightly out of saturation. As a result the collector voltage of Q1 drops and makes the Q2 more OFF. This action continues until both transistors become OFF. Then the capacitor C2 discharges, and transistor Q1 will be switched ON again to start a new cycle. When the capacitor C1 is charged the tone will rise and when the capacitor C1 is discharging the tone will fall. The circuit can be powered from 9V DC. Switch S1 can be used as a power ON/OFF switch. K1 can be an 8 Ohm loud speaker. Hi. Do you have a design ckt. Of this? Like putting another two transistor (cascaded ckt. )Thanks! what res do you use 1% or 5% and what typ? I am ece dep . I need small project topics. Hi Shinoj if you want your battery to get drained fast you can remove on/off switch. No other component can removed from the circuit if want it to function. Hi Shinoj by removing the push switch you cannot produce the raising lowering sound effect in the tone of sound. Hi Abdullah S2 should be on. when S2 is (call-bell push type), pushed the capacitor gets charged, oscillation frequency increases in, while you release S1 the capacitor discharges and the frequency reduces, giving siren effect. once the siren work is over with S1 it can be switched off. (S1 is regular on / off switch. Is it S2 releasing or S1? posting of electronic project circuits on my email address. Of how much volts of capacitor we have to use for 22nF?